Grieving Parents from all over the world lit candles for the child/ren that they have lost. At 7 PM, December 13th, in whatever time zone that they were in, parents lit a candles for their child/ren resulting in candles being lit around the world for 24 hours to memorialize our children. You may include their first and middle name (last names are optional), and the names of loved one left behind, as well as any links to your memorial page to your child. If you would like to have your child's picture included, then send the file of the scanned picture to me and I will place on this page. All requests for candles will be granted, age of child does not matter, as they will always be your child. Submit Prayer Requests for sick, chronic, critical and terminal children. 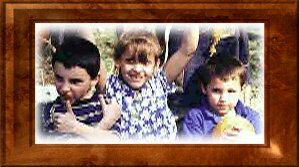 For WebTV'ers and Lower Browsers to submit prayer requests for children. What a lovely idea, to have your child memorialized as an angel and knowing that the proceeds would be helping to help to cure this devastating childhood disease. A SPECIAL ANGEL WILL FOREVER BE IN OUR HEARTS. and on my lips everyday. DID YOU CATCH YOUR BALLOONS & KISSES WE SENT UP TO YOU? Baby Charles, Joseph Franklin and their cousins blow kisses from behind the stars to their family. time where we are is just a little while compared to your time. We will give you kisses for real in just a few minutes of Heaven's time. He will forever be loved. He will never be forgotten." Marked only by periods in which the pain is less intense. Charles D McClure, Kimberly Jane McClure. Your second Christmas with Jesus. In the wee hours of the morning. And I miss you so very much. Jesus came and took you home. As we are in the light. That I love Him so very deeply too. Are there to take care of you Angel! I can't wait to see your smiling face one day! To hold you all I want! You are your brother's Guardian Angel now! Miss you much Angel Baby! And see your sweet face. Fly high, little one, on the wings of our love! Erik Nathan was a very sick baby boy. His parents loved him so much. They visited and loved and kissed on him, showering Erik with their love. Even with the dire and tragic diagnosis, "your son is not expected to be on earth very long", their hearts clenched by constricting metal bands of anticipatory grieving, did they seek the supposed "sanctuary" of denial? Absolutely not, for their love for their special son Erik was beyond compare. Now their love for their son will transcend the flesh into God's Heaven. And while Erik's spirit is now healed, Brenda and Claude, Erik's parents, will mourn and miss him all their hearts until they can once again hold their precious child in heaven again. But, there will not be painful goodbyes ever again! May the Lord heal your hearts Brenda and Claude. Stillborn at 24 weeks and weighed 9oz. We like to call him "Our Little Angel". Killed by a drunk driver! Mommy loves you so much and misses your tiny face! I know I have my own guardian angel in heaven! We love you always and forever and miss you dearly. She was a beautiful person both inside and out. I only had her for 30 years. Heather was murdered at the age of 20 by someone she called friend. Still-born at 20 1/2 weeks, weighed 8oz. My beautiful son Douglas, born 9-26-98 and enterd Heaven's Gates on March 17th 1999 from SIDS. God could not let him stay. Of his tender Shepherd's care. We love you our precious little Angel ! Twin brother Roddy & Sister Bettie. You are forever in our hearts. I will Love you always ! Son, I held you until you fell asleep, to wake up in the arms of Jesus. I miss you more than I can put into words. Little brother has grown so much, he is becoming a fine young man. You would be so proud of him. A thousand years here is but a day in heaven, mama will be home in a few minutes. Rest my son with Jesus, until we can be together again. 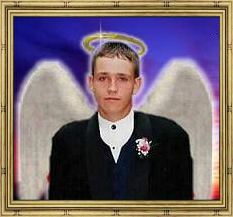 My son left us to be an angel in heaven April 4,1999 he died from an accidental gunshot. He left behind his mom Christy, daddy Mike, and brother Dustyn 8 and sister Jessi 7. He was born May 26, 1995 and he was such a beautiful little boy who had so much love to give. I just want to say that some people only dream of seeing an angel and I held one in my arms. Truly there is no hand so small that it can not leave it's imprint upon the world. Safe in the arms of Jesus, till we meet again. He was born prematurely and was stillborn. My husband and I miss him so. He was born out of wedlock when his mom was only 15 years old. He is with God and His angels. They have no names because they were never born. I only call them My Little Angels. My first child died when I was 3 months pregnant. I miscarried October 20, 1994. The second one I miscarried at 1 month December 26, 1997. His dad told him,"Daddy loves you baby boy." Ryan rolled his head in his dad's direction and said,"I know". Thank you for allowing us to have Ryan. 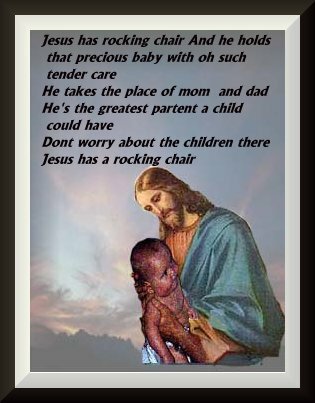 We know you only gave him to us for safe keeping a little while, but that he really belonged to you all along. He was a creation of love, and of all of the beautiful things of Heaven and Earth. His voice was as a gentle breeze on a warm summer day. His smile like sunshine through the rain. His eyes like the brightest stars on a dark night. He loved you Lord, and now he is back at home for you to keep safe where we all hope to be one day. We ask you, Lord, that all those touched by Ryan, who grieve with us will know and understand that your plan is divinely perfect. We Praise you, Father, for our child and now we fully understand the sacrifice you made with your son on the cross. We love You. We praise You. PS Hug our baby everyday, please Lord, and tell him we will see him as soon as you allow. Poetry, links to grief resources, links to memorial pages, bulletin board, guestbook, webrings, chat, and postcard service.